Official licensed & Highly detailed – Rastar 1/24 scale Ferrari rc car is an authentic replica under license of Ferrari S.p.A.; Ferrari remote control car measures 7.3” x 3.27” x 1.77”; Features with adjustable front wheel alignment, front shock absorbers, rims and rubber tyres and metallic paint finish. Full functions – Forward, Reverse, Stop, Turn Left & Right; the remote control Ferrari LaFerrai works best on the flat surface and can be used indoors or outdoors (flat surface in dry weather). Excellent performance – Radio remote control, Speed 4 mph, Remote range up to 30 feet, Frequency available in optional 27MHz or 40MHz. 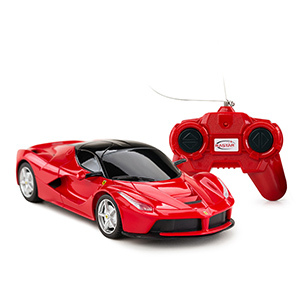 Batteries NOT included – Requires 3 x AA Batteries for the toy Ferrari and 2 x AA Batteries for the remote; Package includes 1 x 1/24 Rastar Ferrari remote control car,1 x dual-grip remote-controller and 1 x user guide. As a leading toy brand, due to its excellent quality Rastar has obtained manufacturing and distribution licenses for more than 300 vehicles from 28 world-famous vehicle brands including Ferrari, Lamborghini, Bugatti, Bentley, Porsche, BMW, Audi, Mercedes-Benz etc. Through innovation of technology and application of new materials, Rastar has developed a series of model cars, which keep the same exterior with corresponding real cars. As a professional toy manufacturer, Rastar has been certified towards a lot of international safety standards, such as CE, FCC, ASTM, F-963, CPSIA, EN71, EMC, etc. In 2004, Rastar was certified by CQC, ISO9001, as one of the 2000 Quality Management System Certification enterprises, thus became one of the first companies obtaining CCC certification. 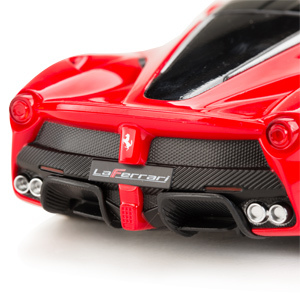 Race around your neighborhood in style with our 1/24 scale LaFerrari radio remote control replica! 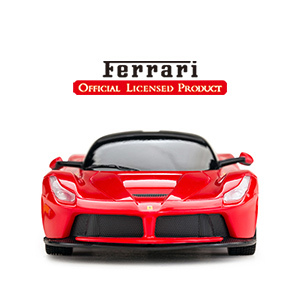 Officially licensed by Ferrari S.p.A., this toy car is based on the full size million dollar LaFerrari made by Rastar. 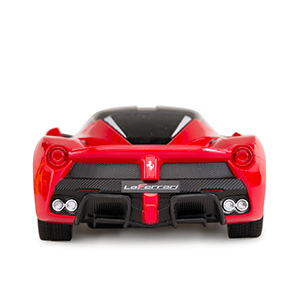 State of the art technology is now yours in the form of a LaFerrari RC car that you can drive forward, backward, left, and right from the included wireless remote control. Reach speeds of about 5 mph and measures about 7 inches long. Easy to use for all ages. Launched as a successor to the Ferrari Enzo, the new LaFerrari is one of the most amazing supercars we have seen lately. Highly detailed interior and exterior, real rubber tires add to the overall realism and the Ferrari red paint job is exquisite to look at. 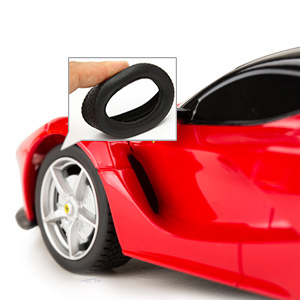 This is a must-have Ferrari model car for every Ferrari lover and car enthusiast. Arrives fully assembled and ready to play with.